Dubai, UAE, 5 March 2018 – Emirates has unveiled a brand new Business Class cabin and configuration on its Boeing 777-200LR aircraft, with new wider seats laid out in a 2-2-2 configuration for the first time. 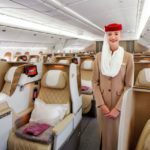 The cabin also features the Ghaf tree – considered the national tree of the United Arab Emirates, and now a signature design on the latest Emirates aircraft. First A350-1000 Tour in pictures at Singapore Airshow 2018.